This piece isn’t just about evaluating the impact open offices have on employee morale, productivity, and communication. Because even though almost three quarters of companies in the US have an open office plan of some sort and industry leaders like Facebook have embraced the trend as collaboration Utopia, robust research led by credible sources like Harvard Business School has presented a very strong case in favour of doing away with the concept. The message has already been received loud and clear. Open offices in their present avatar do not work. Hard data like the instance of an open office in Australia leading to 10% of the workforce contracting tuberculosis is proof enough that savings in terms of space are far outweighed by sick days, declining productivity and utter worker dissatisfaction. While some companies think they can get away with a botched-up copy of an open office, choosing to focus on the immediate cost cuts, others still subscribe to the notion cause open offices done right DO work. And most importantly, open offices of the brands that frequently make it to the “Best Places in the World to Work At” lists have key differences compared to the hard floored, messy, noisy landscape that has come to define an open office in the 21st century. What are bad copies of open offices doing to the workforce? Elizabeth Von Lehe, is the director of strategy and concept design at Icrave. According to her experienced eye, most open offices lack the basic features that can support the journey to unbounded collaboration with the right concessions made for privacy and productivity. Ethan Bernstein and Stephen Turban, the pioneers of empirical evidence based open office research led by Harvard found that the shift to an open design actually reduced in-person communication by a whopping 72%. Correspondingly the use of emails increased by 56% and that of instant messaging platforms spiked by 67%. This can be largely attributed to the fact that human beings are not bees and can’t be likened to insects who need to be together to grow their pool of social intelligence. We have a defined sense of self and even the most extroverted people need quiet time to focus and to tend to their personal needs. In open office spaces with shared desks, ringing telephones and forced listen-ins on private conversations, people get overwhelmed and shut down direct communication to preserve their sanity and their productivity. Impersonal channels like emails that do not require active engagement turn into the preferred channels of correspondence. 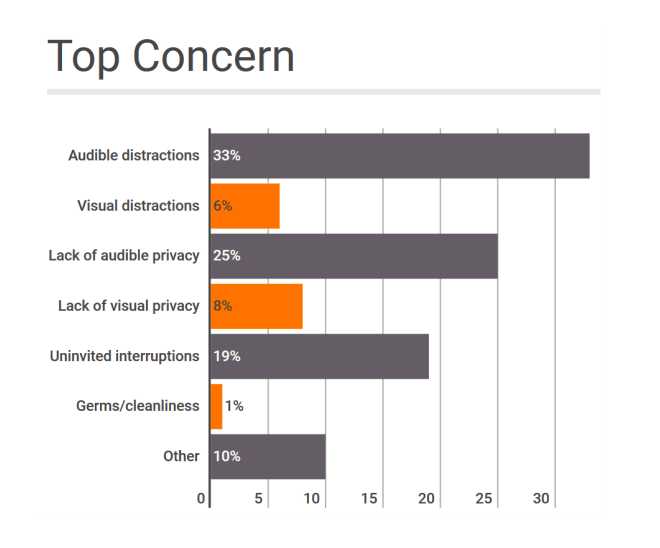 Not surprising since findings by Stegmeier Consulting Group show that audible distractions, visual distractions and their respective lacks of privacy are the top four concerns of open office workers. William Belk has shed light on yet another aspect of the open office disaster. It has found that high performing individuals who take on a lot of problem-solving are impacted the most when companies choose to do away with private spaces and instead advocate hot-desking. While open offices have certainly not given birth to sexism at the workplace, they are unknowingly perpetuating unacceptable behavior. Medium blogger Amar Singh eloquently wraps up the dialogue on poorly designed open office spaces. They turn distractions into an inevitability which even in the era of depressing cubicles were always a choice, one which employees had some degree of control over. The open office is not dead – yet. Because there are examples of great design and flexibility around the world which have kept the spirit of Wright’s work alive. Facebook is the flag bearer of the open office success. But if you really drill down into what makes Facebook’s Menlo Park HQ tick, you come acrossideas that reinforce the need to balance collaboration and privacy. First and foremost, the open office story at Facebook doesn’t end with shared desks. There are conference rooms and plush private areas where people can go to focus on tasks demanding attention. This is the recommendation of almost all architects who give credence to the open office concept. Mark Zuckerberg walks the talk. He is just another white desk at Facebook’s open office and this is extremely important if employees are to embrace the open office space as an improvement that’ll work in their favor instead of a cost cut made by the management. 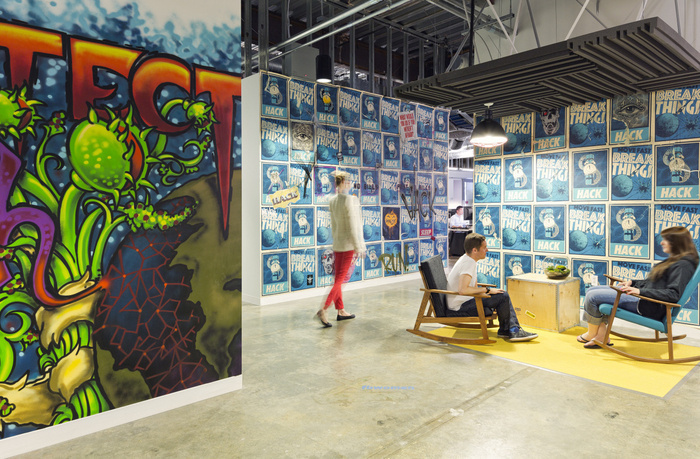 Creativity and purpose are built into the DNA of the Facebook HQ. Bold colors, quirky furniture and the quiet reiteration of the company’s purpose position the open office as a place for innovation that’s rooted in the common desire to make Facebook the best social network in the world. The provision of a rooftop garden, showers, and ergonomic desks and chairs put health first, beyond the shadow of a doubt. Not every company has the budget to pull a Facebook though! This is why Gensler breaks down the salient features of a highly effective open office space. The shift to the open landscape should be made when collaboration is the real motivation and the management is ready to execute a thoughtful design that values privacy, flexibility, and empowerment. About the author: Norberts Erts is the co-founder of HR software company CakeHR, that streamlines attendance and performance management for customers worldwide. Keeping a sharp eye on HR, marketing, business, finance, science, technology and the connections between them.